This is only the second time I've had a guest review! This time the guest reviewer is none other than my dear Mom. I was sent some press-on nails by Kiss that I'm literally unable to review. They're so short and small that they don't even cover half of my nail bed, so... yeah... review not possible. While my hands are on the petite side, they definitely aren't petite enough for the Kiss Petite french nails. However, my mom has some of the smallest hands and nails I've ever seen, so she was a perfect candidate to try these. Just one of the perks of being my mom.... Another is that you have an endless variety of polish colors to choose from when I give you a mani/pedi... Also, I'll give you unwanted critical commentary of stupid prime time sitcoms with identical plots for free! "I liked them because they stayed on-- no bubbles or loosening. 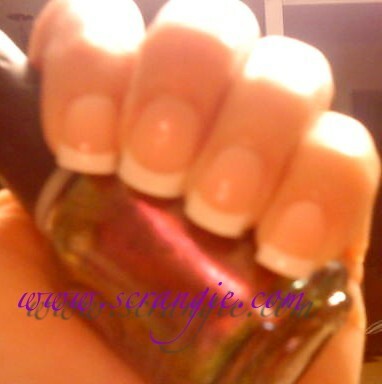 Didn't like because too wide and the color on tip chipped within 2 days." I applied these to her using the Revlon NailStay glue that's included in the Revlon kit. I filed them down to a medium length- these start out pretty long, which I personally prefer because I have longer nail beds, but the long length doesn't work for her. My opinion of these is that they look a lot less natural than the Kiss nails, the tips are too thick and white. 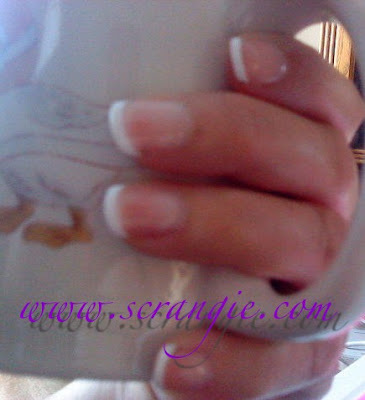 Not that a french manicure ever looks natural, but you know... some are less tacky than others. "I liked these better because they were smaller and thinner. I didn't think the glue was as good as the other brand, it bubbles and I kept getting my hair caught in them. The finish lasted, looked more natural and stayed shiny." I applied these to her using the little disposable tube of glue included in the Kiss set. She's right, the Revlon glue is superior, not just in application, but in longevity. It's kinda difficult to apply the proper amount of glue using those little one-use tubes, and it doesn't set as fast or as strongly as the Revlon. They also lifted on her sooner than with the Revlon glue. However, I think the end result looked a bit more natural. The actual thickness of the nail is a lot thinner so they do look more like a natural nail from a front/head on view. The base part of these nails is clear, so you won't be able to hide any imperfections on your nail or bubbles in your glue, but that also makes the nail look brighter and shinier. She didn't notice any chipping or wear in the white tip of the Kiss nails and she was able to wear them for a whole week with them still looking new. The small width and length of these suited her pretty well. This set comes with some extremely tiny nails- the smallest ones are slightly bigger than a lentil! So if you have extremely petite hands and nails with very short nail plates and you want to try press-ons, these would be the nails for you. The Kiss nails overall seemed thin and lightweight, especially compared to other brands of fakes I've tried. Someone would be less likely to detect that you're wearing press-ons with a nail as thin and clear as these. I can't say I'm a fan of that super bright white tip, but if these had a softer, more milky and translucent natural white, they'd definitely pass for real nails. Thanks, Mom, for contributing your reviews and photos! I think the Kiss petites look a lot more flattering and from what I can tell from the photos, they look pretty natural too. I might have to get some - I've broke a nail and I'm having to file them all right down. So sad for this to happen so close to Christmas! Do you have any nail repair advice? Like with glue/silk wraps etc? Great post! Ive been trying to find some press on's in a smaller size and this really helped. Happy Holidays Scrangie and Mother Scrangie! Very pretty nails! Your mommy has beautiful hands too!!! xoxo scrangie & mommy scrangie nails!!! I liked these because they look so real. And they fit my nails great. I have narrow nails. The Kiss nails look really natural. Hello to Mama Scrangie! Happy Holidays. Your mom has lovely nails also! Thanks for the review! I wanted to know how your mom took off the nails since I am not particularly fond of soaking my nails in acetone. I was wondering if there might be some alternative (ie putting a soaked acetone cotton pad on the nail bed for five minutes). Thanks!